There are many animals who benefit from a foster home. Animals that have been through a medical situation or surgery need a warm home to recover in. Some animals simply need a break from shelter life! There are many families who benefit from being a foster family! You may find certain pets fit in to your family better than others. We hope you become a foster failure and adopt your foster animal! Fostering greatly improves an animal's chances of being adopted into a forever home. Fostering helps to socialize pets and get them accustomed to living in a family environment. 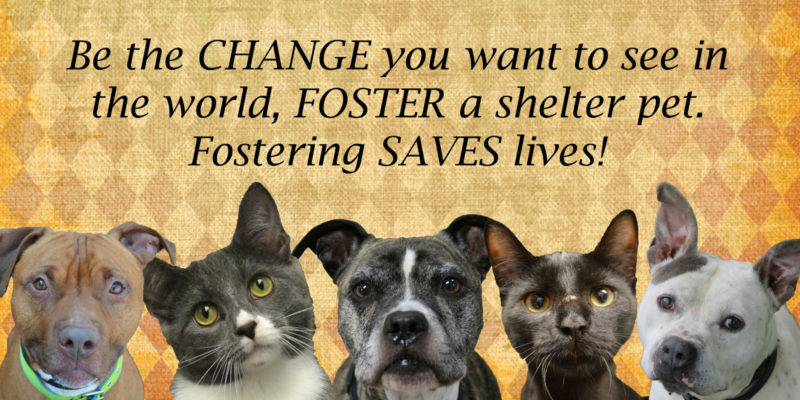 The bottom line is that fostering saves lives! When you open your home to a homeless pet temporarily, you are also increasing the number of spaces available in the shelter to help other homeless pets. Fostering provides animals a home in which they can be supported in a safe and loving environment, which in turn allows them to grow as pets into highly adoptable animals. Fostering teaching animals who may have never been afforded a family atmosphere how to get along in the "pack" and also teaches them some basic manners and social skills. Puppies and kittens need to be eight weeks old to live at the shelter in order to give their immune systems time to develop, and some may need additional medical care pre/post spay and neuter. Very young motherless kittens and puppies will need to be fed regularly around the clock and will need a foster home since the shelter does not provide for 24/7 care. Benefits of socialization include training, behavior modification, higher rate of adoption.